Join us at the reservoir or on the livestream! The first stream crashed, please use this link for the new stream. The day is finally here - AVC 2014! 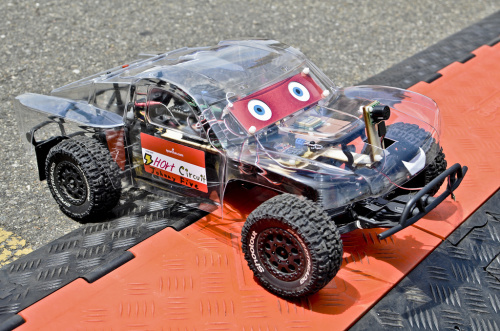 Starting today, June 21st, 2014, at 9 a.m. at the Boulder Reservoir, teams from around the world will be competing in the greatest autonomous vehicle race ever (or so we've been told). Of course, you are still welcome to join us at the reservoir. And why not? It's a beautiful day, the birds are singing, and the quadcopters are zipping through the breeze. The reservoir is easy to find and we've got tons going on, including live demos from some of our favorite companies, food and entertainment. Plus the reservoir itself has a nice beach and is a great place to hang out on a summer day. If you want to join the conversation on Twitter, we'll be using #sparkfunavc throughout the day! Enjoy and may the best bot win! You can see the full list of scores here. Thanks for a wonderful day - we hope you had as much fun as we did! Sparkfun could monetize the AVC by making a premium channel available for a fee. It would be the same as the normal channel except it would have no music. The reasoning behind the music is more complex than you might realize. Thus it became mission-critical for us to avoid capturing any music that the course DJs might be playing at the live event. We did this by pulling an submix from the course mixers with only the announcer's microphones, which got us most of the way there. But we decided to add library music (helpfully provided by YouTube itself) to: A. provide extra insurance against any commercial music bleed-through, B. it was preferable to completely dead audio (we couldn't pull ambient audio from the courses due to the above issue, and continuous audio has become the language of broadcast), and C. because sometimes, it's fun (or at least, I had fun playing overly-dramatic music for some of the cuter robots). This is kind of fascinating. And another one for my ever-growing "we have got to stop letting Google build all the infrastructure" file. Good thought, but I don't think that's quite what SparkFun is about. Dang! Firefox and IE both fail to show the streaming video: "your browserdoes not currently recognize any of the video formats available"
Can you play regular YouTube Videos? When the stream is up (Its been down a fair amount) it is playing fine for me. I am watching directly from the YouTube page and it is running in Adobe Flash Player 14.0.0.125. Try updating Flash Player and making sure it is enabled for your browser.. Thanks JakeR. Just installed flash and now it works! I'm on a new win8.1 install and had not installed flash yet. "Ignite the Market" with the Intel Edison is today!